Aerating your wort with oxygen after the boil to promote a healthy fermentation is standard practice in the brewing industry. However, over the last ten years a small group of commercial and home brewers have been pioneering an alternative – olive oil! When I first heard of the idea of adding a tiny amount of olive oil to your wort (or starter) as a substitute for aeration, I thought it was a joke. However, the technique which was pioneered in some detail by graduate student Grady Hull at New Belgium, has merit and is an interesting alternative to traditional aeration. The traditional approach to a healthy fermentation is to add oxygen to your wort after the boil (typically 8-9 ppm), but before fermentation. 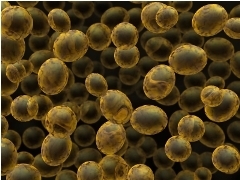 Yeast requires oxygen to produce sterols and Unsaturated Fatty Acids (UFAs). These UFAs are needed by the yeast cells to form cell walls during fermentation, and if not enough oxygen is present the yeast can’t produce enough sterols and UFAs needed for healthy cells. This can result in high ester producetion as well as other off flavors. But what if we could skip aeration entirely and instead provide the UFA’s directly to the yeast? This would have the advantage of avoiding oxygen entirely – which could improve the long term stability of the finished beer. In the hours between when oxygen is added and the yeast consumes during the lag phase it you actually do get some pre-cursors to staling flavors formed – so adding UFAs would avoid this. Grady Hull selected olive oil as his UFA addition, because it is cheap and easily available as an alternative to aeration. He tried several doses, but the best performing was an olive oil addition of approximately 1 mg per 25 billion yeast cells. This would correspond to an addition of approximately 4mg of olive oil for 100 billion cells, which is what an average White Labs or Wyeast package contains. The oil in this case was added directly to the yeast starter before it was pitched in the wort. Obviously olive oil is not a perfect solution. Adding lipids has the potential to affect head retention of the beer – though adding such a small amount (roughly 4 mg for 100 billion yeast cells, which corresponds roughly to a 5 gallon (19 liter) batch) was found to have no affect on head retention. In Hull’s experiments on commercial size batches he found a slightly higher level of ester (fruity) production with olive versus the control batch using conventional aeration, as well as a slightly slower fermentation. However, fermentation did complete and the ester production was found to be well within limits for the ales brewed. In taste tests, the beers brewed with olive oil were fond to be almost identical, except for the slightly higher ester production. Hull also found that as he raised the olive oil use it did slightly reduce the perceived extra ester profile. It is possible that using oil rates slightly higher than 1 mg per 25 billion cells may further reduce ester production. He also did warm storage tests to simulate the effects of aging on the finished beer, followed by additional taste tests. He found that olive oil did indeed improve the long term stability of the finished beer, and that beers made with olive oil instead of oxygen had fewer off flavors after warm storage. While not a cure-all, olive oil does provide an interesting alternative to aerating your wort. Particularly for beers where slightly higher ester production would not impact the overall flavor profile, olive oil may provide better long term flavor stability than traditional aeration. Olive oil should be used in very small quantities tied to the amount of yeast used to avoid potentially negative effects on head retention, as excessive oils will hurt head retention. Hull tested it to 1 mg per 25 billion cells, which works out to 4-6 mg for a typical 5 gal (19 liter) home brewed ale. I’m certain as more brewers experiment with olive oil, we’ll learn more about usage rates and effects. There is an error on the quantity of the olive oil. I have a different source it said 1 milligram per 25 billion cells. 1 milliliter is slightly less than 1000 milligram. So your number is one thousand time more. It will be similar to a soup if you add this much olive oil. End of head retention. Thanks! I just made the correction of ml to mg (which is a lot less!). Without a very sensitive scale, it’s nearly impossible to weigh out 0.005 grams. Any idea how many pipettes drops this would be? 2? I’ve been using a vegetable oil based foam control for the boil, I wonder if that is giving me a similar result because I don’t do very much for aeration and I’ve been getting very high yeast attenuation numbers from all my beers. So how much volume do you need to add? Sounds like a single drop in a 5 gallon fermentation would be more than enough? I can’t see how you’d measure this without a micropipette or some very sensitive scales. Secondly – what about dispersion? I suppose adding it to the wort before adding water would allow for enough mixing. I have been following the Olive Oil debate with interest for a few years now, and it seems to be a really good experiment for home brewers to try. I have had good results myself with adding a tiny amount of olive oil to my batches. However, one point that I note is always missing from these discussions, is the need to make sure the oil and dosing implement, are free from nasties! I normally add it to the water in my starter, before boiling and adding DME. Keep up the good work on the blog and software! I normally just take a sewing needle, or piece of thin wire and dunk it into the oil, trying to get as little as possible to stay on the end. Then simply dip the needle in the water and swoosh it around to get the oil off. We’re talking *really* small quantities needed, so you really shouldn’t see a slick or oil blobs floating on the top, if you do – you’ve probably used too much. Then boil your starter as normal. Another method i have used is to dab the oily needle on to an irish moss tablet before throwing it into the boil, that works too. I just weighed it out and 1mg is pretty much 1µl (+/- 0.2 mg), it’s pretty difficult to measure 1µl of the oil since it sticks to the pipette tip. So what I did was measure out 50µl, add it to 950µl 100% EtOH and split it into ten 100µl aliquots of 5mg oil each (assuming it was evenly mixed). I look forward to trying it next time I brew. Just wanted to intrude for a sec here ….. I’ve been brewing for a few years with dry yeast, and about a year or so ago I bought some liquid yeast …. now I won’t use liquid yeast anymore (tried the tubes twice and both failed to start fermenting, [LHBS said they were probably from a bad batch but didn’t offer to replace them], so I kick started them two days later with Muntons dry ale and they took off) – I only use dry now, rather than waste my money on tubes of liquid yeast! ($2.50 for dry v. 7.50 f0r liquid makes a big diff to me!) I make my ‘starter’ a day or two ahead using DME in water and then pitch after the boil. I’ve never done the aeration, but I own a medical ‘oxygen breather’ machine that a guy had here in town that I got for nothing (supposed to produce something like 75% pure oxygen from what I’ve read about it) – I was thinking of hooking it up to an aerator, but now I’m wondering if I can save the $30-40 bucks by adding a little olive oil after the boil. I’m wondering whether the needle point/olive oil treatment will work with my dry yeast too. I’ve been wanting to try out Olive Oil for a while now but all the articles I read only talk about how it works and not so much the end results. Tom, you say you’ve tried this method with good results. Do you notice any taste difference compared to conventional aeration? I’d like to hear from anyone else who has tried Olive Oil too. Ashley did you try the coconut oil? One thing to consider is coconut oil has a melting point of like 76F or something. So when temperatures in fermenter go below that, would the oil return to small solid states? I’m curious of your findings. Not sure about the coconut oil. Olive oil was deliberately chosen for its oleic acid, which is one of the unsaturated fatty acids yeast produces. It has up to 83% oleic acid vs about 6% in coconut oil. I’d stick with that, especially as pure coconut oil is a solid under 24C as Joe said. You can buy tubs of it for making cosmetics, and it is a solid hard white waxy substance. thinking of doing this myself but a s i understand it the olive oil needs to go in the yeast starter to get best results, what is best option if using a smack pack without starter? Hi all, I understand from the LODO exbeeriment over on Brulosophy that Grady Hull has withdrawn his olive oil method for wort aeration. I proposed olive oil as a viable alternative to O2 in reducing oxygen in beer but Denny Conn responded to say this is discussed in his Experimental homebrew book (which I’ve not read). This certainly goes against my experience of several very effective brews of ale and lager reliant exclusively on an olive oil product for yeast propagation. Do you know anything more Brad or has anyone read the book? I can’t find anything online from Grady to corroborate.